TECH, INC. is a multi-faceted company that provides solutions to problems ranging from concept design to manufacturing in a large variety of industries. TECH, INC. can provide a solution for you! From concept to completion, TECH, INC. is there for you every step of the way. TECH provides cast parts created from RTV molds. Materials range from 15 Shore A Elastomers to hard Shore D thermosets. Even silicone parts can be produced with this process. 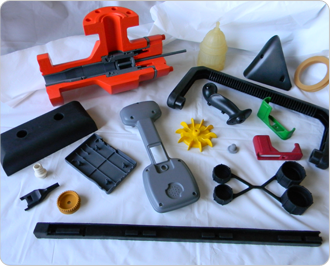 These castings provide a cost-effective and speedy way to emulate injection molded plastic parts without the high price of permanent tooling.These parts can be used as prototypes for marketing, functional testing, and production. Quantities range from only a few parts to hundreds of parts per year. Multiple customers take advantage of the time and cost savings and the ability to release their next ‘new & improved’ product more rapidly than conventional production allows.